A logo is displayed on a cup inside a Starbucks Corp. coffee shop. The trademark office isn’t buying it. Starbucks’ bid to broaden its trademark protection arsenal argues the coffee-drinking public doesn’t need its siren logo to associate the design with the mega-chain. But the PTO has repeatedly said Starbucks’ sparse use of the green dot fails to establish a “distinct commercial impression” in the absence of the logo. Both sides will appear before the U.S. Trademark Trial and Appeal Board to argue their case at a Nov. 21 hearing. The application seems like a proactive measure to further protect its “very strong brand,” which is important to shareholders, Argus Research Corp. securities analyst John Staszak said. He didn’t know how much this particular effort would add, and said he was more concerned with specific efforts to drive customer traffic. Starbucks didn’t respond to a request for comment from Bloomberg Law. The PTO declined to comment on an open application. 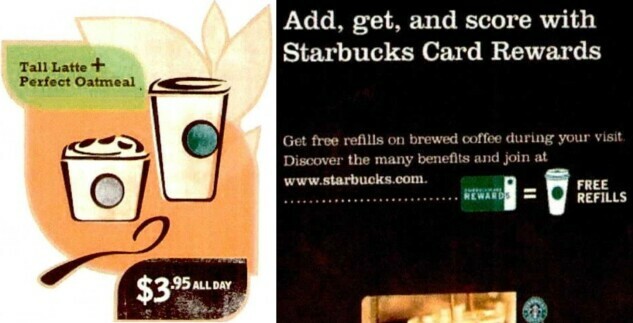 Starbucks said in its 2012 application it has used a cup with green dot as an icon on gift cards, a mobile app, and in-store displays. It argued that its actual cup logo, including the siren, looks like a green dot from far away. Starbucks appealed a final examiner rejection to the board in 2015 and asked for an oral argument in September after a series of rejections and revisions. The fight tests how far big brands can go in registering simplified or incomplete versions of well-known logos. The outcome could clarify the threshold for sufficient use of a derivative mark to create a distinct consumer impression. But since past registrations aren’t binding precedent, the case may end up just another example of how application of trademark law hinges on examiner judgments of unique, case-specific facts. Trademark examiners must decide whether an applied-for mark has “acquired distinctiveness,” apart from other branding. Other companies have successfully registered designs minus core logos, such as the silver and blue pattern behind the Red Bull logo and the label placement on a Johnny Walker whiskey bottle. Other incomplete looks, like an outline of a Wendy’s sign, have been rejected. Starbucks cited a survey paired with expert testimony that it said decisively shows most coffee consumers recognize a white cup and plain green dot as “Starbucks.” An examiner criticized the survey’s methodology, though Starbucks complained the examiner only did so—baselessly—four years after it was submitted. Starbucks also noted it had previously registered plain circular marks on cups based on its old logo, with lettering and siren removed. But the old logo had clearly delineated circles whereas the siren is integral to its new emblem as it dissolves into the white background, the examiner said. The examiner claimed Starbucks’ specimen icons did not match the applied-for mark because they included either a cap or foam obscuring the rim of the cup. The examiner also said Starbucks’ failure to “identify the scope of the mark as a three-dimensional mark” was enough to sink its application. Distinguishing between 2D and 3D had no basis in law or precedent, Starbucks argued in its appeal. Specimens “must only create in the mind of the purchaser an association between the mark and the identified services, not expressly identify them,” Starbucks said. Alexandra Roberts, a trademark law professor at the University of New Hampshire, said the core question is whether the plain circle, by itself, functions as a clear indicator of who made a product when a customer first sees it.